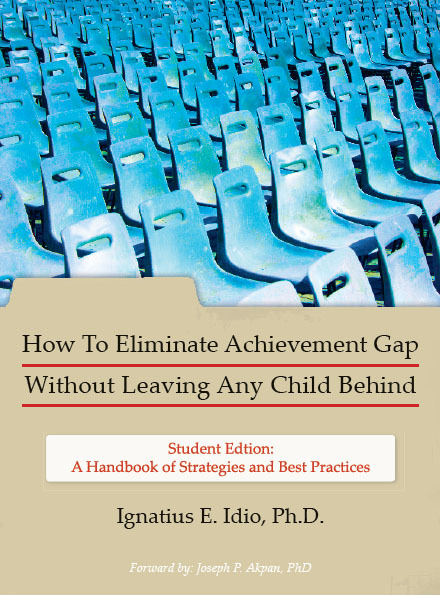 How To Eliminate Achievement Gap Without Leaving Any Child Behind Student Edition: A Handbook of Strategies and Best Practices « Ignatius Ekpenyong Idio, Sr.
Today more testing has become the norm rather than the exception in our schools.This book addresses the questions: Why should teachers assess student learning? Do students really learn the specific curricular objectives that teachers are teaching? How do teachers and instructors know whether or not students are really learning and mastering the concepts that they are teaching? It presents the different assessment tools available to teachers and instructors to use in assessing student learning. With the mandates of the No Child Left Behind Act of 2002, this book also identifies the things that states, local districts, and individual schools are doing to narrow the achievement gaps. Finally, the book summarizes the research findings about what works in teaching and learning.